The Part-Time Audio and Music Technology Course is one of our most popular courses and we get a great mix of people on it every year, including musicians, songwriters, sound engineers, DJ’s & people who love to experiment with music technology & learn how to record musicians. With the next course kicking off in September, we thought it’d be useful for anyone considering the course to learn a little more about the course director, JJ Vernon, and what he’s got lined up for you this year…..
JJ, can you tell us a little more about yourself? Sure, well this will be my 6th year running the part-time course here at Pulse College. When I was a student myself, I originally did a degree in English and Philosophy but when I finished that I was keen to work with music, so I did a Higher National Diploma in Popular Music and Sound Recording in Manchester. I moved to Ireland back in the early 1990’s. I came over to work for Bill Whelan, the Riverdance composer but he wasn’t the Riverdance guy just yet! He was an experienced composer/arranger & ran a company called Irish Film Orchestras. Irish Film Orchestras recorded film scores for Hollywood films. Iconic LA composers such as Elmer Bernstein (The Magnificent Seven, The Great Escape) travelled to Windmill Lane Studios (one of the only studios in Ireland big enough to accommodate large orchestras) to have their scores recorded. At that time Dublin was like Eastern Europe is now for orchestras – world class musicians available at a far cheaper rate than could be found in the US. Now a lot of the orchestral work is recorded in places like Budapest in Hungary. 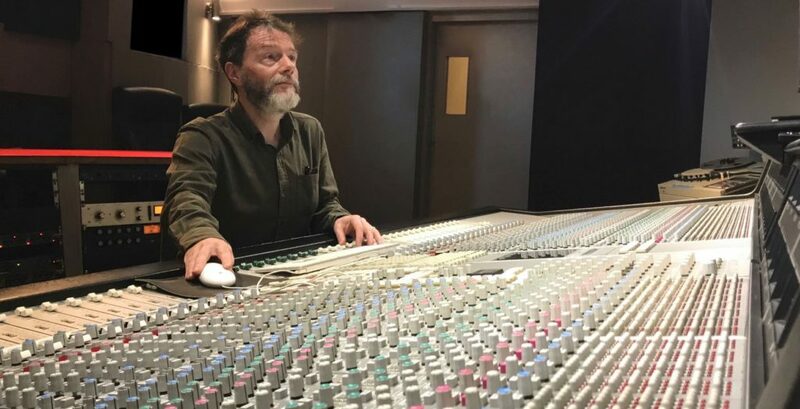 After my time with Bill Whelan, I worked in theatre as a composer and a sound engineer and I really enjoyed that – composing for plays & touring with the Abbey Theatre as a sound engineer. I decided to do some more study in the area of music for film and did a qualification in Film Scoring, accredited through UCLA & Screen Training Ireland. I learnt how to write for orchestras and how to conduct – that type of stuff! I won a competition run by I.M.R.O. to score the film All God’s Children which was recorded by the R.T.E. concert orchestra at where else? Windmill Lane! I eventually found my way into teaching and I love giving back knowledge to up and coming engineers here at Pulse. I knew Tony Perry, founder of the College, quite well from various film scoring projects down the years and we started to speak about me getting involved in teaching. An opportunity came up on the Part-Time Audio and Music Technology Course and I jumped at the chance! Who’s the part time audio and music tech course aimed at? The course is mainly aimed at hobbyists – those who are passionate about creating and recording music and want to learn some new skills to take their recordings to the next level. People who have a love of music, recording music and music technology. There’re no prerequisite qualifications needed – you don’t need to hold any certificates or be the next Bruno Mars to get a place on the course. The good news though is that on completion of the course you will get a Pulse College Certificate to highlight your achievement. What will you be covering on the course? Here we’ll look at lots of different elements for creating and recording electronic music so synths, samples and sampling, creating and slicing beats…..
Students will learn all about how to become sound engineers and run studio sessions by recording live musicians in a studio, maybe a band or ensemble in the world-renowned Windmill Lane Recording Studios. We’ll look at mic techniques, recording drums, piano, guitars, bass, vocals etc. How to use a mixing desk add dynamics, introduce effects and also how to mix music effectively. Students will cover 2 industry standard software packages – Pro Tools and Logic Pro. Students will also complete the vendor exams for these – Avid Pro Tools 101 & 110 and Apple Logic 101. There are some really cool projects that we’ll be looking at too. For example, students will have to compose a small piece of music. Now it’s important to know you don’t have to be a super-hot musician to do this. It can be as simple as playing along to a pre-programmed backing track of some bass lines, chords and samples and the students then would tap out a beat on a drum pad or manipulate a filter sweep. It’s a lot of fun but in practice it really is a great learning experience too. During the course everyone will be spending some time working with keyboards, so there’ll be plenty of opportunities for tapping into your creativity to deliver on this project! Something that’s always very interesting is when we get in guest lecturers…. For example, we might get in a top sessions musician, maybe a drummer or guitar tech to talk through their instrument and what set-up they like when they’re recording in a studio. It’s a great experience to learn from people at the other end of the mic. Do students work in groups to complete their projects? Yes, at certain times they do, and it works out brilliantly – the quality of the projects are always fantastic. For example, when recording bands, the students are split up and they need to work together in teams. They learn a lot from each other this way, as naturally everyone has their own unique strengths and skills and they help each other out. Perhaps someone has excellent music or programming skills, or someone has already quite a bit of experience micing up instruments – then everyone can lend a hand at different times. I’m very proud to say it’s a very inclusive course and students and lecturers all support each other along the way. Participants are also free to come in to work on their projects in the labs when they need to. What day does the course run? We run the course on Saturday’s. We found that people were coming in after work which was hard for them and having it on a Saturday was better. It’s also worked particularly well for people travelling a bit of a longer distance to get here. Like what you hear? Why not drop along to an open day, see the facilities here at Pulse College and chat with some of our team? This entry was posted in Audio Engineering, blog, Part Time. Bookmark the permalink. Please choose your area(s) of interest.